Please refer to our stock # 3513 when inquiring. 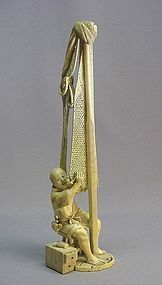 This very well carved and rare Japanese ivory okimono is a mid-19th century product. It is 10 ¾” high, 3″ wide and 2 1/4″ thick both measured from the bottom. It depicts a fisherman sitting on a wood stool with his tool box on his side. He is repairing his broken fish net which is hanging on a tall pole. The artist (carver) did a wonderful job on the fisherman’s robe, his cigarette pipe and pouch, even the tool box was carved with wood grain. The facial expression, the muscle on the legs, arms and hands are all realistic. It has very nice patina. Aside from some old repairs, it is in great condition.